As a Childrenâ€™s Pastor it is my highest honor and privilege to sit down and talk to a child about salvation and/or baptism. Most of the time these conversations to do not begin with talking with me, instead it is the culmination of many talks between parents, teachers, and others who have invested time, love, and prayer into the lives of these children. In the midst of these conversations with parents and children I have noticed several recurring issues regarding salvation and baptism. Often times parents will encounter difficulty in how they explain certain parts of the gospel, or will grow frustrated in how their children seem to be responding (or not responding) to their efforts. The following are several things to consider when talking with children about the gospel, salvation, and baptism. 1. Concrete v. Abstract Language. It is a physiological development of the mind to move from concrete to abstract understanding of life. 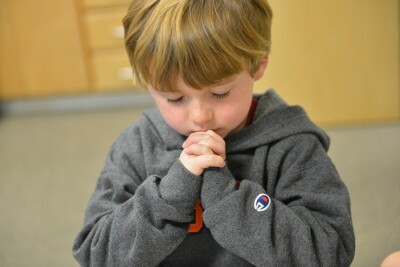 In order for a small child to understand the gospel, it has to be explained in a way that is age appropriate for them. For example, for a five year old when he hears, â€œask Jesus into your heart,â€ he worries if it will hurt to have a tiny man named Jesus living in his chest cavity. He does not understand that this is not what you intended. So consider the age of those you are sharing with and take into account of their age and development levels. Parents shouldn’t worry if their child don’t fully understand the gospel in one sitting. Learning and understanding is cyclical. Tell them, explain it, then do it again, and again, and again. Eventually, it will “click” in their brains and they will understand. But don’t shortcut the process of the understanding moving from their brains to their hearts. 2. Draw pictures. Let them â€œseeâ€ what you are talking about. One of the best tools that I have discovered when talking with children is to draw things out as I am talking. You could also get the children to draw them with you as you are talking. 3. Avoid â€œChristianese.â€ Explain your terms as you us them and avoid unnecessarily technical words. Adults tend to use words like â€œthe prayer,â€ â€œask Jesus into your heart,â€ â€œreconciliation,â€ â€œjustification,â€ â€œrepentance,â€ etc. If they are saved, what are they saved from? Who is Jesus, the Holy Spirit, the Father, etc. Remember that you are talking with children not seminary professors. 4. Separate salvation from baptism. These are two separate events in the life of the believer but children tend to lump them together. There have been many children that I have talked with that say, â€œI want to be baptized so that I can go to heavenâ€ (or something close to this phrase). Children tend to confuse and inward decision with an outward expression. â€œwalking the aisle,â€ or â€œgoing forwardâ€ is not salvation or a decision to place their faith in Christ. These are outward expressions of a decision that has already been made in the heart. 5. Determine Motive (as best you can). Parents have more insight into their childâ€™s lives than any other person. Children naturally want to please their parents or adults, so it may be helpful to get the opinion of another mature believer who may have a relationship with the child. Also, be aware of events surrounding the childâ€™s life that may influence them (like did they see their friend or sibling baptized last Sunday, and now they want to as well). When you feel comfortable that the child is seeking to please Christ and no oneÂ else, then they are ready to follow in baptism. Of course there are some over zealous parents who are pushing their children to make a decision they are not ready for, but this is where your church family comes in and helps to balance that zeal with wisdom. 6. Ask Open Ended Questions. These types of questions require explanation, not simply yes or no answers. 8. Avoid Group Decision Making. Ok, everybody letâ€™s â€œsay the prayer.â€ â€œNow if you want to go to heaven then raise your hand.â€ The best way to counsel children with regard to salvation and baptism is one-on-one. There are many unscrupulous mission groups out there that are more concerned about reporting how many children â€œprayed to receive Christ,â€ than their actual spiritual development. You may have a person sharing the gospel from a stage to a large group, but there should be counselors who can speak with those children who would like to discuss salvation further one-on-one.